Explanation: Tracking along the southern Milky Way this beautiful celestial mosaic was recorded under dark Brazilian skies. Spanning some 20 degrees it actually starts with the dark expanse of the Coalsack nebula at the lower left, tucked under an arm of the Southern Cross. That compact constellation is topped by bright yellowish Gamma Crucis, a cool giant star a mere 88 light-years distant. A line from Gamma Crucis through the blue star at the bottom of the cross, Alpha Crucis, points toward the South Celestial Pole. Follow the Milky Way to the right and your gaze will sweep across IC 2948, popularly known as the Running Chicken nebula, before it reaches Eta Carinae and the Carina Nebula near the right edge of the frame. About 200 light-years across, the Carina Nebula is a star forming region much larger than the more northerly stellar nursery the Orion Nebula. 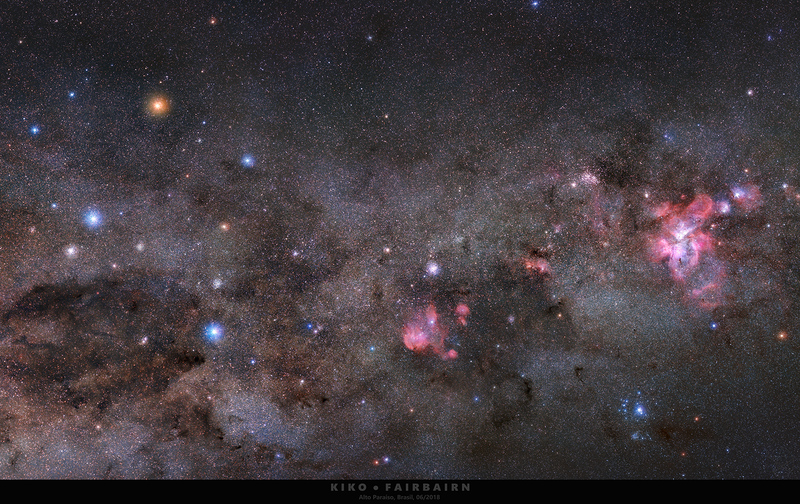 The Carina Nebula lies around 7,500 light-years from Earth along the plane of the Milky Way.